Whelping rooms are built to simulate a cave-like atmosphere offering protection and warmth, much like dogs used prior to being domesticated. Whelping rooms are required for the safe birthing and raising of larger litters. Kumfi Kennels Whelping Rooms can be temperature controlled with the purchase of additional heating/cooling systems. There are multiple styles of doors available. Each Whelping Room can be built using one of the two different wall thicknesses – 50mm or 75mm. Each room is specifically designed to the breeders needs. Ideally all Whelping Rooms should sit on a concrete floor with adequate drainage. Call us to discuss the drainage options for your whelping room. Your whelping room will be delivered flat packed with assembly instructions. 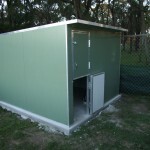 We do offer to build it for you at an additional charge.